Sorry, I have been missing in action. No excuses- just doing all sorts of things. We've been exercising more, which has been good. We had a great bike ride at the Mcleans Island track, and a good walk around the Halswell Quarry Park. The quarry is a very interesting place, so I must take my camera next time. We decided climbing the hill there is a good fitness test because I moved at snail's pace lugging myself upwards. Hopefully I can improve. I was rather excited to find a real satsuma mandarin at the supermarket. This beauty was from Japan, and I bought just one as a treat. And a treat it was. I think it was probably one of the most delicious mandarins I have ever had, and was a fair size too. None to be found now. Maybe they will just be a Christmas treat. These can be seen at West Melton currently, and I was so pleased that I pulled over for a closer look. They are stunning. I have been doing some harvesting at home. Mr Mouse approves of my shallot crop. The vegetable patch has made me exceedingly pleased. I love the tall bean tower, even though the beans haven't started producing yet. Zanny is looking so beautiful at the moment. Her coat is dappled and her chewed tail is growing back nicely. Aria ate quite a bit of it. Well Aria got the blame, but it could have been Fergie. She was having a nice snack after I washed her. You can see the strange cyst on her bum cheek - it is not ugly, just unusual because it seems to be filled with air and crackles strangely when you run your hand over it. Apparently she has had it for many years, and it never changes. We have enjoyed some more rides out along the road, although we did have some difficulties with a bird scarer cannon today, which alarmed us both horribly blasting like a shotgun repeatedly. Zanny spun around and headed for home, and I really couldn't blame her. 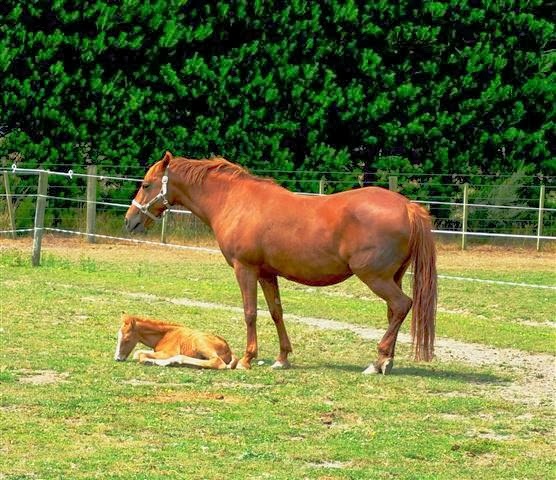 Look - there is a lovely new addition to the horse herd at the farm. This lady and her brand new colt foal are boarding at the farm currently. The wee man is less than two days old. He is a very pretty colour. I guess he will darken up to be the same colour as his mother, as they don't usually stay the same colour as they are born. He has lovely white markings, including a bit white blaze on his face. It will be interesting seeing him change as he grows. He is at least half quarter horse, so will look very different from Aria and Fergie as he grows up. I am busy working on a blouse currently so I must take some photos. Hope it works out cause I have had to make the sleeves shorter than I hoped due to a fabric shortage. I am working on organising my craft cupboard and dug out some pieces of fabric that will do for sewing projects (experiments). I have been watching Dexter while sewing, like usual. Every project has a touch of serial killer built into it. Very strange. I have also started watching The Darling Buds of May, which couldn't be any more different. I adore the books, and just finished them, and love the television adaptation too. We discovered today that there is not another dressage twilight event on Monday, so I won't be going out with Zanny sadly. Never mind, I am happy enough riding at home. Tomorrow will be another good riding day, and I have more gardening and sewing to do. I love the holidays so much. Wow those poppies are amazing, as is Zanny, beautiful. Your garden is looking lush and your sewing project sounds good...looking forward to photos. Glad your exercise is going well.